I discussed face markers on the fretboard recently with Tosin Abasi, of Animals as Leaders. The reason was that with the fanned frets, the visual cue that side markers otherwise provide is only really valid for the bass side of the fretboard. So on #15, which is being completed for Misha Mansoor of Periphery, I am implementing a compensated positioning of the side markers to provide a solid and familiar impression when viewing the neck from the upper right position. The wide angle lens of the camera approximates the eye in the image above. Click on the image to zoom, and you will note that the side markers for fret 5 and 3 are progressively shifted towards the player, to be positioned closer to the virtual center of the scale. 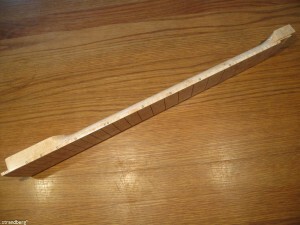 The 7th fret marker is placed equidistant between the frets and moving up the fretboard, the markers are placed progressively farther away from the player. The intent is that this will help guide the fingers to a familiar position with even less adjustment required for the fanned fret layout. This is an older article, but I just found it. What a simple solution to this issue of side fret position dot perspective on multi-scale necks. I built a 7-string, 25-1/2″ treble to 27″ bass, perpendicular fret at the 7th: at first, the lower positions were not a challenge, neither seeing nor feeling, but above the 12th, as the bass side leans toward the bridge, I got lost pretty fast. With future instruments, I will split the board at the 12 to minimize this effect, but it’s cool to see others have thought about this little challenge when playing multi-scale guitars. Thanks!